If you want to amass thousands of followers on Instagram, you have to be willing to invest a fair amount of time into designing the aesthetic of your Instagram content. After all- that’s all that really matters to your followers! Every person or business has boundless potential to create great content, but it is difficult to know where to start and what kind of content to share. We’re here to help. What’s most important when it comes to content creation is to focus on creating content that aligns with both your goals and your audience. Your content needs to align with your goals and your audience in order for you to see successful results on Instagram. If your content does not align to your goals, then your content is not serving its purpose. If your content does not align to your audience, your content will not receive high engagement. To successfully grow a large Instagram following, you will need goals and analytics to make sure that you are getting results that you want. Without goals and metrics, you won’t know if the new strategy you’re trying out is working or if Sunday at 2 pm really is the best time to post for you. When it comes to content creation, you need to decide what to post, how to post and when to post so that your posts receive the most engagement from your followers. Before you get into thinking about your visual style, it’s good to have a clear vision for the type of content you’re putting out. 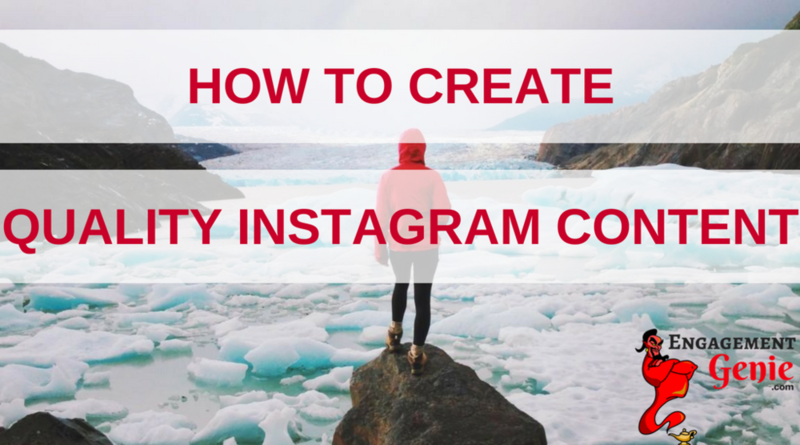 The most important part of any Instagram content creation strategy is to decide on what kind of content you will produce and remain consistent. When you produce the same type of quality content on a consistent basis, you are building your brand and a loyal following of people who know what to look forward to with your posts. We break down what to post into what we call content pillars. Creating quality content consistently is easier than you think once you have established content pillars to build from. FedEx's feed consists of photos based around the theme of FedEx’s delivery drivers, vans and planes out in the wild. they often feature images shared with them by followers, too – a great way to keep their fans on the lookout for FedEx vehicles to photograph. Their feed also gives off a vibe of high-end, artistic photography. Adobe's feed consists of bright, colorful photos that serve to highlight the usefulness of Adobe's editing tools like photoshop and lightroom. The content pillars include remarkable photographs of landscapes and nature as well as reposting and crediting graphic design work from other Instagram users. Adobe also does behind the scenes content by sharing the stories of their employees occasionally with a professional photography for each employee whose story is shared with their audience. Color Palette: Picking out a cohesive color palette will help make your feed consistent and focused. However, having a color palette does not constrict you to only using 3-4 colors, instead, it can be more like having either vibrant colors, pastels, black n white, etc. Doing so will give your posts a familiar feeling. All of your posts need to fit with a content pillar you selected and be the same style to stay well branded. When you have designated content pillars and a consistent style, you know what kind of content you are going to post and your followers know what kind of value to expect from your posts. This keeps them coming back for more. Without content pillars and style, your page will resemble the kitchen junk drawer- lots of mix and matched posts that really need to be cleaned up. Original content is photographs you took and edited yourself or a quote or saying you came up with. Creating quality original content will make your account skyrocket, but it does take some time to make original content. To make the best use of the original content creation process, document the process to get more content out of a single endeavour. When it comes to writing captions, take your time to make sure they are well thought out. An important thing to note is that captions cut off in users' feeds after three to four lines of text. So be sure to include the most essential information first to make sure your followers get your message. To encourage engagement in the comments section of your posts, include a call to action in the caption. A call to action is one of the best ways to increase the shareability of your Instagram post and engage your followers. Examples of common calls to action include encouraging your followers to tag a friend or share their experience. When it comes to using Instagram hashtags, it can be a bit of a touchy subject; some people hate them, and some people love them a little too much. Using the right hashtag (or combination of hashtags) can help you expose your brand to large and targeted audiences. For example, let’s say you’re going to post a photo of a French Bulldog. Instead of just tagging #dogstagram (over 15 million posts), you could also tag #frenchie (over 5 million posts) and #squishyfacecrew (over 1.3 million posts) to reach a more targeted audience of people who really love French Bulldogs. This is the best way to use hashtags to get a lot of targeted engagement on your posts. Have a bank of 30 hashtags that are specific to your niche and post 3 - 5 in the caption of every post. Rotating hashtags is better for Instagram growth than posting 30 of the same hashtags every time.